You are currently browsing the VanHulsen blog archives for July, 2009. I feel the muscles in my hands aching, originally uploaded by Aiko and Thomas. but i’m very happy to be able to restore a house back to how it was designed. The notched of roof lines are very difficult to do But they are instrumental for the design of the house. The architect -some 80 years ago – knew what he was doing. 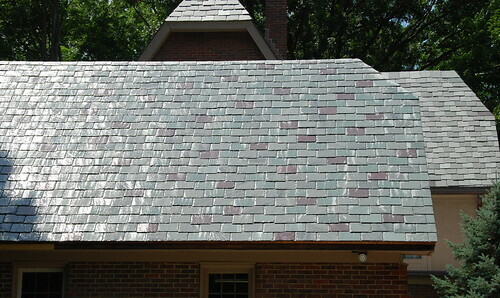 The size and shape of the roof construction was meant to carry this slate. 27.5 feet at the bottom, 17 feet from gutter to ridge, the notch is 6 x 5 feet on the diagonal. 17 feet up with an exposure of 8.5 inches means 26 rows up. He – the architect- probably wanted to square out the pattern and above all: facilitate the slaters, so they wouldn’t get into problems. Sometimes I had the feeling that my new nails were sinking in an original nail hole, put there by the first slaters. independence day, originally uploaded by Aiko and Thomas. Tomorrow I’ll celebrate my first true Independence day. Sorry Beatrix (queen of Holland), you lost one. My new flag is called Stars and Stripes. I wasn’t so much in love with kingdoms anyway. 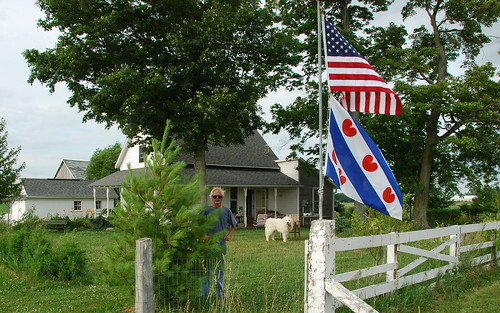 My Friesian flag is proudly hanging underneath as a display of my heritage.